Want to walk, relax and enjoy nature while still staying close to the city? The Katy Trail is the place to be! The trail is used for walking, roller blading, running and cycling. It’s a concrete trail that goes from SMU, all the way down to the American Airlines Center. It is about 7 miles total round trip, 3 ½ miles one way. You’ll feel like you’re in a true oasis right in the heart of Dallas. 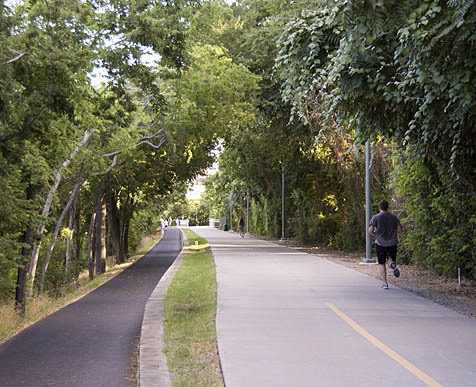 Each year there is Katy Trail 5K that helps raise money for expansion and upkeep. If you’re a local or visiting DFW be sure to check it out the trail! Visit the Katy Trails website for more information http://www.katytraildallas.org.